Prince Frederic von Anhalt has never been one for tradition, so when it came time to celebrate 25 years of marriage, the traditional anniversary gift of silver just didn't fit. Instead, Anhalt spent $68,000 for a billboard on Sunset Boulevard. 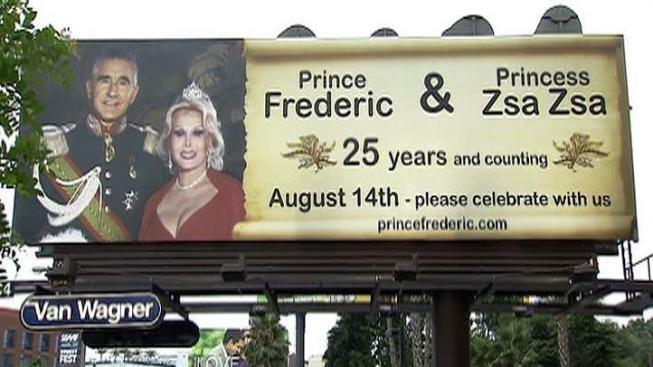 "Prince Frederic & Zsa Zsa Gabor: 25 years and counting," reads the billboard unveiled Wednesday. "August 14th - please celebrate with us." The 44-foot billboard, located at 8789 Sunset Blvd., will be up for a month. "What is my wife going to do with a piece of jewelry? She wouldn't like it. She wouldn't like it at all. She has been on her sickbed for nine years and last year she had her leg amputated," Anhalt told the Daily Mail. "I always ask her what she wants and she always says champagne and caviar but she always gets that, so it's not a present. I wanted to do something special. We were talking about when I ran for governor and I said 'let's do something crazy again' and that's when I had this idea, so she can see it on the television," he said. Details about the couple's anniversary are posted at princefrederic.com, along with a countdown clock.